You'll have a wide range of opportunities to play symphonic music, as well as opera, classical pops, chamber, contemporary and period performance at Royal Birmingham Conservatoire. The programme also includes wind and string orchestras, brass band and percussion ensemble. 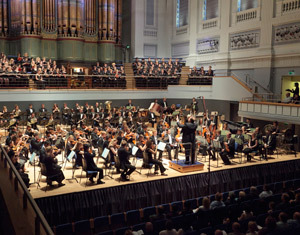 The Symphony Orchestra, Royal Birmingham Conservatoire’s premier orchestra, plays two short concerts each year at the Symphony Hall – one of Europe’s finest concert venues – as part of our close relationship with the City of Birmingham Symphony Orchestra (CBSO). We also go to the city’s splendid Victorian Town Hall for our end of year concerts, as well as performing in our own 500 seat Bradshaw Hall. The Repertoire Orchestra is Royal Birmingham Conservatoire’s ‘apprentice’ orchestra, where you will have the opportunity to learn your craft as an orchestral musician. Concerts take place in The Bradshaw Hall, and cover a wide range of repertoires. The Pops Orchestra gives the invaluable experience of working in the styles of light classical music. Recent performances have explored popular Christmas repertoires and film music. In this ensemble we address the vital issue of working with contemporary classical music, usually in chamber music format. Capelle is our dedicated period instrument orchestra which performs music from the early seventeenth to late eighteenth century. Students have access to the Conservatoire’s extensive collection of period instruments as part of their course and specialist Early Music tuition is available on most instruments. Recent performances have included Monteverdi’s Vespers of 1610, Baroque concertos by Vivaldi, Fasch and Wassenaer, Purcell’s Dido and Aeneas, and sacred works by Michel de Lalande directed by Artistic Director of Capelle, Jeffrey Skidmore, OBE. Playing in the Opera Orchestra is a very special skill. Annual productions take place at the nearby Crescent Theatre, and recent highly praised performances have included Street Scene, by Kurt Weill and Puccini’s Trittico. Our two experienced staff conductors are Edwin Roxburgh and Daniele Rosina.